Knee dislocations are rare injuries, but are among the most serious of all traumatic extremity injuries. Initial assessment of vascular status is critical due to the potential for injury to the popliteal artery. Late complications include decreased range of motion (ROM), instability, pain, and the inability to return to previous activities and sport. Given the rarity and heterogeneity of this injury, high-quality clinical studies and randomized clinical trials are largely lacking to help guide treatment. Continued areas of the debate surrounding the operative treatment of the multi-ligament-injured knee (MLKI) include early versus delayed reconstruction, repair versus reconstruction of the posterolateral corner (PLC), and preferred treatment of the medial side. Prognostic factors associated with improved outcomes include younger patients, injuries sustained secondary to sports rather than motor vehicle accidents, and the use of functional rehabilitation. The optimal timing for surgical intervention remains controversial with more recent evidence suggesting better outcomes for early treatment when possible. Specific factors on an initial assessment that may guide treatment include vascular status, concomitant injuries, and skin condition. Although many authors report improved outcomes with surgical intervention, arthrofibrosis remains an important concern. In general, the specific structures injured dictate early versus delayed reconstruction. The literature reviewing the outcomes after surgical treatment is difficult to assess and is inconclusive due to several factors, including limited subject number, lack of objective measures, heterogeneity of patient populations and injury patters, and varying surgical procedures utilized. 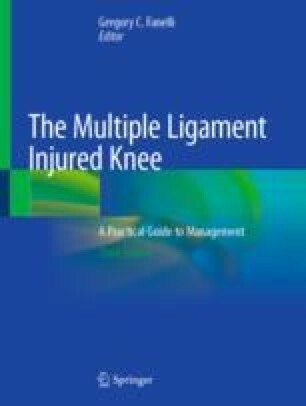 Here we present the best evidence in the literature regarding the outcomes of treatment of the multi-ligament-injured knee including outcomes specific to the treatment of injuries to the medial side of the knee and the PLC.